We had a chance to take a virtual fieldtrip to Windy Creek Kennel, home and kennel of Ken Anderson. Ken completed his rookie race in 1999 and has run consecutively since 2002. He’s had five top ten finishes and has finished twelfth in the last two races. He has always finished in the top twenty since his rookie year! Ken offers a wonderful virtual fieldtrip to his kennel using GoTo Meeting. He typically shows a slide show where he discusses sled dog racing, the Iditarod, and his life in rural Alaska. He also has the capabilities to take the kids right into the dog yard and introduce them to the athletes. I have participated in this virtual trip with my classes for the past three years and it is always one of the highlights of our year! Since it was after the race, and our time was limited, we changed things up a bit for our visit this year. Ken showed the kids the scenery around his home. He pointed out where Fairbanks and Denali were and gave us a quick glimpse at the dog yard as a tease of what was to come later! Then we just started asking questions! It was really interesting to have a conversation with a competitive musher after wrapping up with Monica Zappa, who as a rookie, had totally different goal for this year’s race. 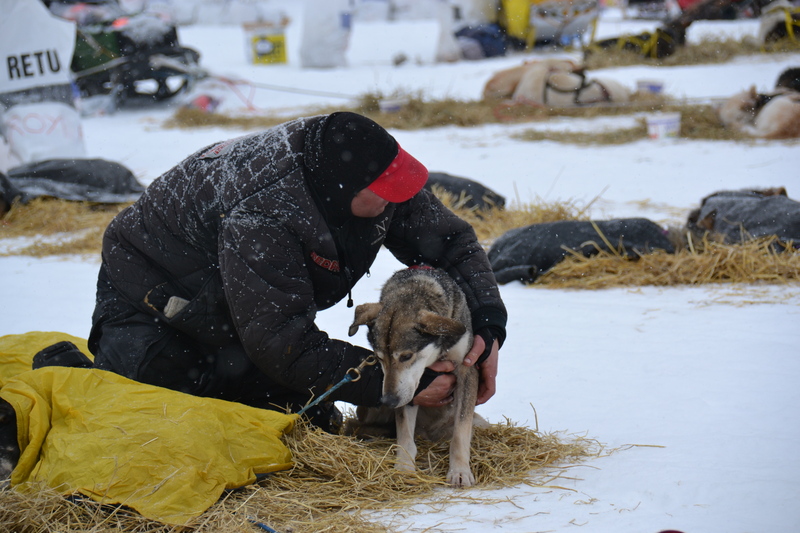 Ken reports, as most other mushers have, that yes indeed, this year’s race was hard. He said that he felt it was especially hard coming out of Elim. There were steep hills and no snow and it was downright scary. “I used to think the Yukon Quest was tough, but this was terrifying,” he said. He feels successful because he didn’t seriously hurt himself and his sled held up well. Concerns about the rookie and less experienced mushers really worried Ken however. He said he was always confident that he is a good sled driver and would make it, but he was very worried about many of the other mushers. The boys wanted to know if the dogs slipped on the ice when it was really windy and slippery. Ken told us that the mushers sometimes take the booties off on ice to give the dogs a little better traction with their claws. This isn’t a foolproof strategy though. The dogs nails are intentionally clipped short to save wear and tear on booties, so they don’t really have long nails to grab the ice. He said that were places on the trail this year where the dogs actually blew sideways on the trail! “Was there someone on the race you really hoped to beat?” was another question presented to Ken. He kind of laughed and said, “Yeah, all of them!” As a competitive veteran, Ken is in it to win it! He always goes into every race with the goal to win. And he’s been very successful with that strategy! He says that he gets along with the other mushers, but they are competition. He has beaten them all in one race or another at some time in his career… except Jeff King! He says he has never finished ahead of King in a race. Summer training was another popular question. Ken says he has tried different things over the years to keep the dogs in shape during the summer. In years past, he has taken the dogs to glaciers to work in the summer. Cruise ship passengers on vacation can take an excursion in a helicopter to the glacier to take a dog sled ride. This is a good way to keep the dogs running and to keep them socialized when there is not a lot of snow in the rest of the state. One year he offered summer cart rides at his home kennel. He feels, however, that the dogs aren’t really made to do hot summers. He will run them on the trails around his home only if the trails have water on them. This summer he has a new strategy to try. He is planning “swim” the dogs. He is putting in a pool and is going to let the dogs “run” in the pool, or swim, to keep their strength up. The boys suggested that he might want to join the dogs in swimming laps to keep himself in shape as well! The highlight of the trip was getting to go to the dog yard and meet the dogs! Many of the boys saw and heard about dogs who they have drafted for their own fantasy teams, which was just amazing! Ken explained that the dogs were lethargic at the time of day we were talking (early afternoon). He said it is just part of their biorhythms, and if we looked at the team’s run times during the race, we would see that they often rested on the trail during this time of day. The boys were tickled to meet the dogs of the Thomas the Tank Engine litter – I think they relived their childhoods for a few minutes remembering all of their old train friends! Ken says it definitely the plan to run the Iditarod again next year. He doesn’t think he will do the Yukon Quest though. This year it was pretty tough on the team to do both and he needs to work carefully to balance his family and his dogs! He does have five year old twins and a three year old!